Review posted November 3, 2016. Atheneum Books for Young Readers, 2016. 180 pages. Castle Cranshaw, who's giving himself the nickname Ghost, learned to run the night his dad shot at Ghost and his Ma. So when I was done sitting at the bus stop in front of the gym, and came across all those kids on the track at the park, practicing, I had to go see what was going on, because running ain't nothing I ever had to practice. It's just something I knew how to do. It turns out that Ghost is as fast as the fastest kid on the team -- so the coach lets him join. But Ghost's Ma will only let him stay on the team if he can stay out of trouble. And then all the other kids have nice shoes. How can he ask his Ma to pay for shoes like that? This story is simple -- a kid's life is transformed by becoming part of a team -- but it's carried out well. There's nothing stereotypical about the story, even if you can sum it up in a stereotypical way. 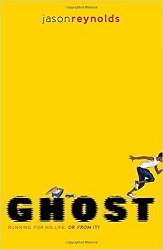 The details of Ghost's life -- the particular ways he gets bullied, his particular temptations that get him in trouble, the particular kids he gets to know on the track team, the particular coach with a bald head and missing tooth who drives a taxi -- all those particulars make this story come to life and feel like something we haven't heard before. I cringed when I saw "Track: Book 1" on the title page, because the last two books I read were also Book One. But this book is complete in itself -- Okay, they don't tell you who wins the race at the end, which is slightly annoying, but the story is complete and gets us to Ghost's first race. All the same, I'm glad I'll get to find out what happens next for Ghost and his new family on the track team.